Band keratopathy is a chronic degenerative disease characterised by the gradual deposition of greyish opacity in superficial cornea over months or years in eyes with chronic uveitis or on intensive topical therapies containing phosphates. The mechanism of calcium deposition in the interpalpebral area of the cornea is multifactorial: salt precipitation as tears evaporate, necrotic debris from superficial keratitis, inflammatory changes in the pH of the ocular surface and the breakdown of phosphates.1 ,2 Band keratopathy can result in severe visual loss from corneal opacification. The main goal of surgery is to restore corneal transparency, providing visual rehabilitation, and avoiding amblyopia in children. Treatment includes removal of calcium deposits by chelation using ethylenediaminetetraacetic acid (EDTA), or superficial keratectomy or phototherapeutic keratectomy.3 The choice of the surgical technique and the required depth of surgery can be optimised by prior visualisation of the calcium layer. This is now possible with anterior optical coherence tomography. 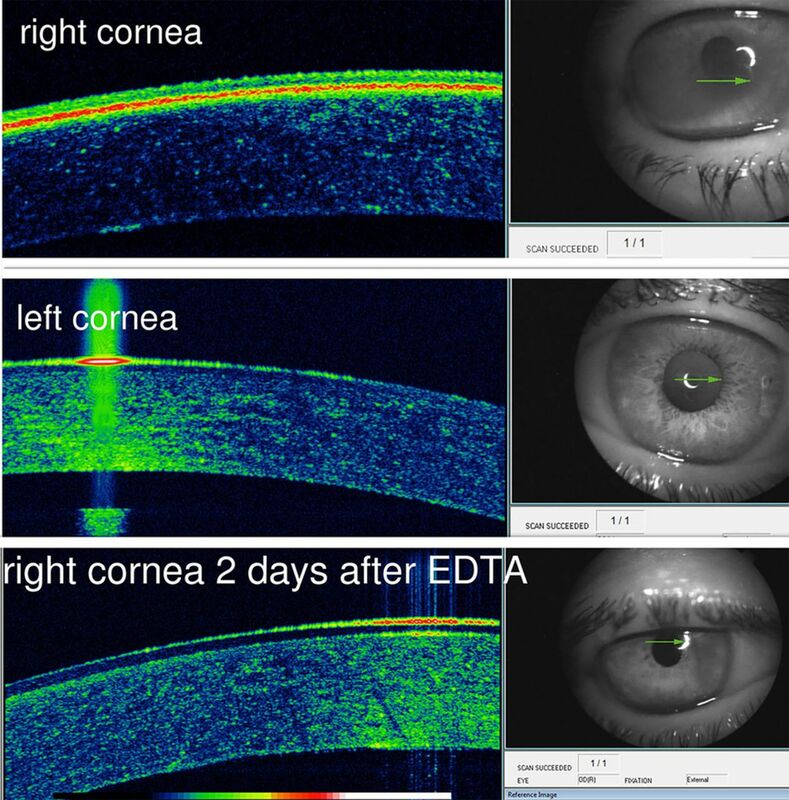 We present the anterior optical coherence tomography of a patient with band keratopathy (figure 1) that demonstrates the presence of highly reflective layer around Bowman's membrane corresponding to calcium in the right affected cornea as compared to the normal left cornea (figure 2). These scans are reminiscent of histological sections of corneal specimens from band keratopathy showing linear dense extracellular subepithelial basophilic granular deposits positive with von Kossa stain for calcium.3 No previous anterior optical coherence tomography findings in band keratopathy were published in the literature including PubMed and Google.1–3 The hyperreflective layer disappeared following EDTA therapy (figure 2). Band-shaped keratopathy in the interpalpebral area before therapy. 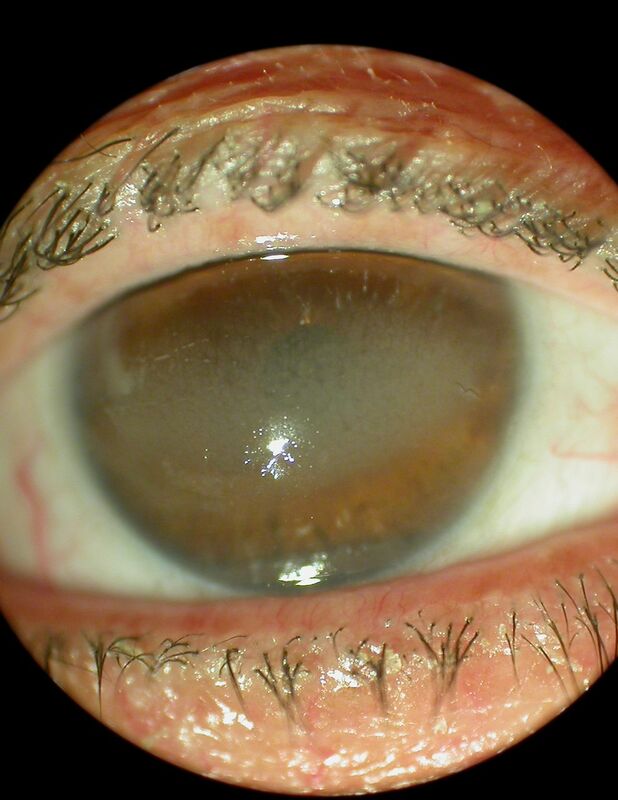 The right eye of this 62-year-old woman who had multiple vitreoretinal surgeries for recurrent retinal detachment with high-density silicone oil fill of the vitreous. The patient was on sodium hyaluronate artificial tears for dry eye for several months and subsequently developed band keratopathy with loss of vision from 20/400 to hand motion and with no view of the fundus. Top composite. Anterior optical coherence tomography of the right cornea shows a superficial hyperreflective layer around Bowman's membrane. Centre composite: Anterior optical coherence tomography of the left cornea. The left eye had no surgery and was not on topical drops. It serves as control and does not display a zone of hyperreflectivity around Bowman's membrane. Bottom composite: Disappearance of the hyperreflective layer 2 days after chelation with EDTA. EDTA, ethylenediaminetetraacetic acid. Optical coherence tomography can delineate the exact extent of calcium deposition around Bowman's membrane in a similar way to histological examination. Optical coherence tomography can help in deciding the optimal surgical technique of band keratopathy depending on the depth of calcium deposition. Contributors AMM wrote the manuscript and RH did the clinical workup and collection data.